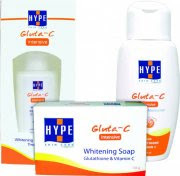 Hype Gluta-C is a skin whitening products line. Hype Gluta-C claims to whiten skin effectively. This product line is endorsed by actress Jodi Santamaria-Lacson. Hype Gluta-C Whitening Moisturizer+SPF 25- effective whitening with Glutathione, Kojic Acid, Arbutin and Vitamin C plus sun protection factor of 25. Price: Php 249. Check out groceries and drugstores for the new Hype Gluta-C Whitening line. Pls. visit our website http://www.mtsp2011.com po for some informations about the event or approach me po at this adress po echo.galido@gmail.com for sending my proposal through your email po fax or even personal Tnx po. Have a Great day!